Conclusion: One side of this representation of the global metabolic shift links food energy-dependent microRNA biosynthesis to healthy longevity. The other side of the global metabolic shift links the virus-driven theft of quantized energy from autophagy to catabolism. Biologically uninformed theorists link catabolism from mutations to evolution. Serious scientists link fixation of RNA-mediated amino acid substitutions to cell type differentiation and all biophysically constrained biodiversity. VacA perturbations in mitochondria are linked to alterations in cellular amino acid homeostasis, which results in the inhibition of mammalian target of rapamycin complex 1 (mTORC1) and subsequent autophagy. Without the food energy pheromone-controlled reproduction of gut bacteria, the virus-driven degradation of messenger RNA links autophagy from mutations to all pathology. Simply put, there is not enough quantized energy from food to support RNA-mediated DNA repair and homeostasis. …bolstering amino acid pools prevents VacA-mediated mTORC1 inhibition. 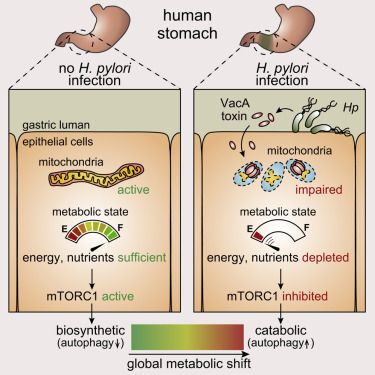 Overall, these studies support a model that Hp modulate host cell metabolism through the action of VacA at mitochondria. How might that model be linked from mutations to evolution for comparison to my model of ecological variation and food energy-dependent pheromone-controlled ecological adaptations? Bacteriophages, viruses in the bacteria of the stomach and all other bacteria cause the degradation of messenger RNA that links mutations to all pathology. Misrepresentation of biophysically constrained viral latency cause other pseudoscientists to miss the facts about RNA-mediated fixation of amino acid substitutions and cell type differentiation. The facts are known to all serious scientists. The virus-driven degradation of messenger RNA in bacteria is linked to the creation of archaea and L-forms via lost fixation of RNA-mediated amino acid substitutions. McEwen et al., (1964) linked the quantized energy-dependent creation of ATP to the creation of RNA. That placed the facts into the context of Schrodinger’s claims in “What is Life?” (1944). All serious scientists have since followed Schrodinger’s lead and McEwen’s lead. Most of them realize that life is quantized energy-dependent and that the quantized energy is biophysically constrained in the food that organisms eat. That allows them to link the metabolism of food to the pheromones that biophysically constrain viral latency, and to dispense with the pseudoscientific nonsense of neo-Darwinian evolution. if archaea are indeed our sisters and not our mothers, one could imagine that some common features present in Bacteria and Eukarya have been inherited from the last universal common ancestor (LUCA) of all life and subsequently lost in Archaea. Archaea exemplify what happens in the context of the virus-driven theft of quantized energy from bacteria with degraded messenger RNA. They are the last stop before L-forms. They are not our sisters and there is only one domain of quantized energy-dependent life. Life biophysically constrains viral latency. Archaea and L-forms are losers.